Manga means "sleeve" in Spanish, and La Manga del Mar Menor is just that, a sleeve of land reaching out into the sea, surrounded on one side by the Mar Menor (Littlest Sea) and on the other side the Mar Mayor (Biggest Sea) and cluttered with hotels. La Manga is on the Costa Cálida, just before the Costa del Sol, next to Belones and to one of Spain's most popular golf courses at the Hyatt Club. It belongs to the Province and Region of Murcia. Los Belones. 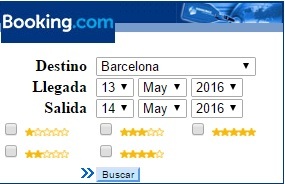 Tel: +34- 968 331 234. Definitely the best hotel on offer in the Manga, but also the most expensive. Set on the hills overlooking the village Belones (where visitors will find The Corner Shop, selling British food, drinks, books, birthday cards...), the Hyatt offers luxury accommodation (from full-board to self-catering) in a lovely setting and direct access to one of Spain's best golf courses. The Sol Galua Hotel is an excellent choice for a family holiday. Its setting means that the hotel has sea views from all sides. 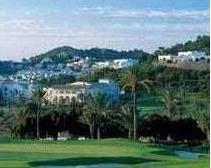 Although it is one of La Manga's oldest hotels, it has been reformed, and facilities are clean and modern. The hotel Galua has helpful staff, spacious rooms with balconies overlooking the Mar Mayor, a large swimming pool with direct access to the beach, a "cyber-corner", beach games for children during the Summer and an excellent breakfast buffet. Hotel Villas La Manga overlooks the Mar Menor (not all rooms have sea views but, as in any hotel in la Manga del Mar Menor, the nearest beach is just a minute's walk away). The hotel offers junior suites which all have a double room, bathrooms and a small sitting room with a sofa bed. Update July 2009: We are no longer recommending this establishment to our users. On our last visit it was in an evident state of disrepair. All suites have been converted into studios with kitchenette, the restaurant and cafe have been closed, our studio smelt of urine, the wifi was not working, the air conditioning was so loud that we had to turn it off, open windows and put up with La Manga nightlife noise, including frequent ambulance sirens and party-goers arriving back to their studios. We cancelled our second night and lodged a complaint about the smell. Definitely a place to avoid for the time being. C/ Gran Vía s/n, La Manga. This hotel is set next to the Mar Menor and all rooms have views overlooking the sea. The hotel has friendly professional staff and is becoming one of La Manga's most popular choices. One of first hotels to be built on La Manga, Hotel Entremares has managed to keep up with the times, and although if you look closely you can see the wear and tear, it is still one of La Manga's most popular hotels. Good views, spa facilities, a beach-bar and organized games for children help add to its appeal. One of La Manga's largest hotels, the Cavanna is set next to the Mar Menor and is a good choice for families and children. It has a park, swimming pool, natural health center offering spa and beauty treatments, tennis courts and its own sailing club offering lessons to guests.